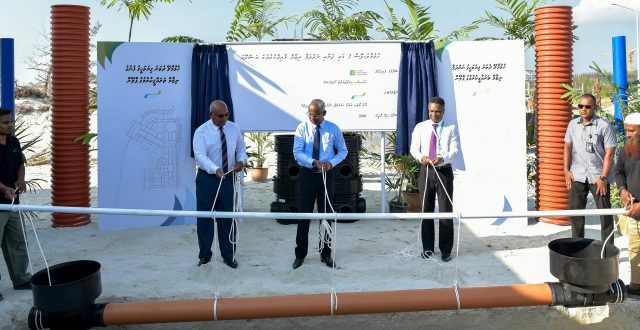 H.E.P Ibrahim Mohamed Solih inaugurated the groundbreaking ceremony to install water and sewerage network in Hulhumalé Phase II. The ceremony took place in Hulhumalé this morning, in which HDC was the hosting partner with MWSC. H.E.P Ibrahim Mohamed Solih was accompanied by HDC’s Managing Director Mr. Suhail Ahmed, MWSC’s Managing Director Mr. Adam Azim and senior management and staff from both HDC and MWSC. The water and sewerage network as well as the water storage system, that will also be established under this project, will be able to cater to the soon-to-be inhabited land of Hulhumalé Phase II. This development will be able to provide clean water to the entire population of the area which, H.E.P Ibrahim Mohamed Solih believes, would effectively reduce the need and cost of using artificially produced clean water and contribute to the reduction of single use plastic water bottles. With the promising future Hulhumalé Phase II holds, considering the various developments currently planned for the city, the establishment of two of the most basic utilities for the future residents of this land will be historically recognized as one of the major milestones reached in the development of Hulhumalé city.